The Super NES is known for many great things. Obviously Nintendo’s own wonderful games, and some of the most memorable efforts from names like Capcom, Konami, Square, and Natsume. These efforts often resulted in excellent adventure games, action RPGs, and action platformers. In recent years a number of new games have shown up paying homage to these titles. But not all of them have done it as well as Owlboy. PROS: Beautiful visuals. Tight controls. Engrossing story. CONS: A few annoying bugs. Objectives aren’t always clear. PIXEL ART: This game really does raise the bar for the art form. Owlboy is easily one of the best modern platformers done in a style that resembles the 16-bit titles of yesteryear. Immediately you’ll be blown away by the insane amount of detail in the pixel art. The shading of the grass, the gradients in the clouds, and the plethora of tiles that make every background, and object stand out. Not only is there a great amount of detail, but so much of it is animated. Animated so well, in fact, that it matches the characters with their text balloons almost flawlessly. Speaking of facial sprite animation, and text balloons, Owlboy has a story on par with many coming-of-age animated Disney films. When the game begins you take control of an owl named Otus. Otus isn’t well liked by most of the inhabitants of Ville. He’s mocked, teased, bullied by many of the other owls his age (often because of his muteness), and he’s ostracized by adults. He gets blamed for things he has little to nothing to do with. He has one friend named Geddy who works defense for the town. Things change drastically one day, when a mysterious troublemaker distracts the two, and allows an invasion of pirates to occur. From here, our pariah has to go on a three arc adventure to become the hero. Along the course of the story new characters get introduced, and this is where the game’s mechanics start to really take shape. Owlboy combines the Platformer with Adventure, and Action RPG elements to create something pretty special. You’ll explore different towns, and talk to NPCs the way you might in a game like Ys, or Faxanadu. You’ll explore areas the way you do in Metroidvanias. You’ll get into boss fights on par with those of the Classic Mega Man series. The developers at D-Pad even went the extra mile to make the shop one of the most entertaining moments in the game. Otus can run, jump, fly, and do a couple of roll attacks as you go through the game. But he can also pick up some of the NPC characters you’ll meet, some items, and even some enemies. All of which are needed to solve puzzles, and get to a lot of areas. Most of the puzzles are fairly challenging to solve, involving every possible thing you can lift. Throughout the campaign you’ll also find fruits, and vegetables that replenish health too. Around halfway through the game you’ll find a shop. It works a little bit differently than the typical shops in most RPGs, and Adventure games. Rather than simply buy items with the money you have, the shop keep sends out employees to just give them to you once you have enough coins. They don’t take the coins from you though. So it’s almost like a level up progress bar accented with comedy. These moments are quite hilarious too. The game makes excellent use of its characters, and animation to deliver laughs. Rather than simply give you the normal mundane experience of grinding money until you can buy the best kit, it’s gives entertainment. And these funny moments fit right in with the rest of the story. The story is great, the characters, are great, and everything else for the most part is as well. Not only do you get a bunch of interesting challenges to solve, but you’ll also do your fair share of platforming. Any good platformer requires excellent, and responsive controls. Owlboy has them. As you jump, fly, and switch characters around, things feel natural. So while things may look insurmountable at times, with enough practice you’ll get through them. The game utilizes the Adventure feel of checkpoints rather than the life system many retro-platformers do. These are fairly numerous, so there aren’t very many times you’ll find yourself re-doing long stretches of hurdles upon a mistake. That isn’t to say things will be easy. There were a few parts of the game that I found myself spending thirty to forty minutes on because I didn’t do just the right move. Or because I didn’t kill an enemy quite fast enough. But again, perseverance pays off. If you don’t give up, you’ll get through it. The game is a lot of fun too. It scratches the itch of just about any old-school experience you can think of, and it’s engrossing. It makes you feel accomplished when you do something grand, and it doesn’t feel discouraging when you fall down. There are also plenty of moments that will just wow you. From riding rock dragons, to infiltrating bases, to the tremendous boss fights, there is a lot to love. Boss fights bring back the era of memorizing patterns. Much like the Mega Man, Castlevania, and Contra games of old, each fight makes you watch for openings. Eventually you’ll realize the boss is doing the same thing, and you’ll learn where to move, or which character to utilize, at what time. Most of them have several forms though, and with each form, a new pattern to learn. But through it all, you’ll have a great time. Whether you were in that era or not. As I’ve stated before, Owlboy looks astonishing. But the soundtrack goes along with it all so beautifully. The game has a wonderful orchestral score that flows from scene to scene, and area to area. It’s as if a Metroid game were filled with symphonic songs inspired by classical composers. None of it really comes off as cliché either. It’s almost expected in any fantasy setting to hear strings, and woodwind instruments. But here again, it feels like an animated Disney film. There are up tempo notes of optimism when things are looking up for our characters, and there are bombastic yet somber moments when it looks like all is lost. It probably isn’t the sort of thing you’ll listen to on a work commute, but it does accent the story, and gameplay very well. It would be easy to write the game off as some niche experience for geezers like me who jammed on Ys III, Mega Man X, and ActRaiser on the Super NES back in the day. But it really isn’t, and you’re doing yourself a disservice if you skip it because of that impression. Yes, indeed, there are plenty of things to like for those who were around for the 16-bit console wars of the 1990’s. But the new twists on gameplay, identifiable characters, and well told story, are things anybody who likes video games can experience. Owlboy joins the ranks of well-crafted, memorable indie releases like Axiom Verge, Giana Sisters: Twisted Dreams, Undertale, and VVVVVV. It isn’t without its faults, as even the best games have some issues. In the case of Owlboy it seems to be bugs. Minor bugs, but annoying nevertheless. One of which seems to screw up your controls at random. Loading from the last checkpoint seems to fix it. This only happened to me once, near the end of the game. But it’s still worth mentioning. Another is how, at least on PC, the game still runs in memory even after exiting to the desktop. Pulling up the Task Manager in Windows allows you to shut it down, but it’s still 30 seconds of annoyance. There are also a couple of times in the campaign where it isn’t always clear where you’re supposed to go next. But this is really a minor nitpick since you’ll be spending a good portion of time just exploring anyway. Overall though, Owlboy comes highly recommended. It’s fun, engrossing, and has something for just about anyone. It’s a game that will likely garner an emotional response from you, thanks in part to the excellent animation. It’s a game you’ll likely cherish in part because of the story, and characters on display. But it’s also a game you’ll likely enjoy going through due to the top-notch play control, and well crafted gameplay. Owlboy is a must play addition to any collection. Well it’s been out for a few days, and you’ve heard everyone tell you to run out, and buy it. Not only the game, but a new Nintendo Switch to play it on. As well as a pro controller, extra joy cons, and maybe a case or screen protector. “It’s a killer app! Totally worth spending over $400 on!”. But with no other major titles coming until the summer, you might feel like I do. Is it really worth spending all of that now? PROS: Nearly everything about it. CONS: Pointing out the few things wrong with it almost seems like nitpicking. WOW: This will impress Zelda, WRPG, JRPG fans, and those who like none of those things. Well to some, it will absolutely be worth spending the extra money on a new console to play this game. To others it won’t be. But if you happen to own a Wii U, and collect games for it, you will want to buy the latest Legend Of Zelda title. Just like the Twilight Princess, this entry comes on both the platform that is retiring, and the platform taking the other’s place. If you’re waiting on the new system, and have the old one play it on the old one. If you simply have to have a valid excuse to buy a new console no matter the circumstance then play it on the new system. I could end things there, telling you to just buy the game. But I’d be remiss if I didn’t tell you just why, all of this hype, praise, and fervor is warranted. The Legend Of Zelda: Breath Of The Wild does something previous Zelda games, including the best ones, haven’t been able to do. This game does something for every type of player. 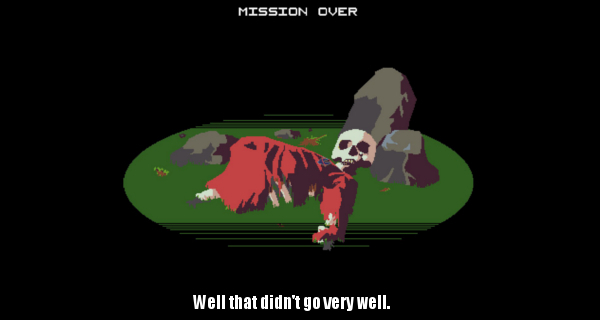 Previous games might have been too RPG for an action fan. Or not RPG enough for an RPG die-hard. There wasn’t anything cerebral enough for the Simulation fan, or maybe competitive enough for someone who rarely touches a single-player game. Other people like me, are generally casual Zelda fans. We’ve played a couple of the hallmark games, like the original NES game, or A Link To The Past on the Super NES. But haven’t gotten into the 30 plus years of the lore. So this game does a wonderful job of giving lapsed fans, and newcomers a window into just why so many devoted Zelda fans love the series so much. Things start closely to the way they did in the original Legend Of Zelda. As Link, you are taken out of a deep magical slumber. Though it eerily resembles the cryogenic machines you see in many a science fiction story. There’s a voice that tells you, you are needed once again. You exit a cave, and see a vast, vast land upon you. When I say vast, I really do mean vast. The world of Hyrule in this iteration is one of the biggest open worlds ever presented in a video game. If you thought any of the Grand Theft Auto, Saints Row, or Elder Scrolls games had large worlds you haven’t seen anything. But more importantly, and equally impressive, is that there is almost always something to do in Hyrule. You can spend tens to hundreds of hours completely ignoring missions. Just spending it wandering around without it getting old. Sure, one can cite driving over people in Saints Row 2 for a couple of hours. But eventually, you get tired of it, and shut the game off. Here, you’ll stumble upon enemy camps. Or you’ll find something out-of-place, investigate it, and get an item from the creature who moved things around. You can go mining for raw materials to have things crafted. You can go fishing, or hunting animals for meat. You can collect wild fruit, and vegetables. You can use all of the stuff you’ve harvested to cook meals. Cooking meals is not only something fun to screw around with, it’s an important part of the game. Meals can often net you benefits akin to power ups. Some meals will give you warmth to survive sub-zero temperatures. Others will make you run faster. Some can give you increased attack power, or cause you to take less damage. On top of that, the game implores you to experiment. Try adding unconventional ingredients to meals just to see what happens! Often times you’ll get meals that would make someone projectile vomit, but sometimes it results in something that would even make Gordon Ramsay pleasantly surprised. Of course, this is still a Zelda game, so you’ll be doing a lot of the stuff you’d expect from an action RPG, or an adventure game. You’ll find towns, talk to people, and be granted with all kinds of side quests, and errands. Doing these often nets you with rewards that make the main quests you’re given, a bit easier. Which is something for newcomers to keep in mind. You can go anywhere in Hyrule. Not figuratively, literally. You can get to any vista you set your eyes upon. The thing is, some of these areas will be quite hostile, and lethal when you get there. Especially if you’re unprepared. The storyline is a bit of a departure from previous games. In most of the previous Zelda games, you had to save Zelda from Ganon, and that was the main goal. In this one, you find yourself in a Hyrule Ganon has pretty much held hostage for a century. Zelda isn’t a captive this time, she’s an active combatant. I won’t say much more than that as the game is still new enough that I’m trying not to reveal too much. But there are a ton of characters you’ll meet, and interact with. These conversations, and experiences tell some of the story, but that’s just it, it’s some of the story. A big chunk of this game, again, feels like a Western Role-Playing game, where your game play experience is a bulk of the story. You’re deciding where Link goes, what he’ll level up first, and what weapons he’ll use to fight. There are all kinds of weapons in this game too. Even things you wouldn’t think of as weapons, can be used as weapons. You start the adventure with no weapons of any kind. Alone, you have to go into the wilderness, and discover things on your own. Run into a monster unarmed? Better find something, anything to defend yourself with. You can use sticks. Limbs of a defeated skeleton. Farm equipment you stole from a village. There are bows, swords, and spears to be found. If you’re resourceful enough you can find your way out of a situation. Every weapon in the game, intended or improvised, can break too. So you really have to make sure you have something in reserve for a backup. But you can also play very stealthily, and avoid a lot of combat by trying to sneak your way into shrines, landmarks, or other objectives. This is actually the preferred method when all of your weapons are broken, you’re low on supplies, and the nearest town is a fortnight away. You can climb any surface, save for during the rain, where things become slick. (Because there has to be *some* realism). Though you also have to keep an eye on your stamina. Get too tired, you’ll fall off of that cliff to your doom. Or drown in the pond. Or pant after sprinting, and get shot by a goblin archer. Or gored by a wild bull. Which brings me to another point. The difficulty. The Legend Of Zelda: Breath Of The Wild is tough. If you’re ill prepared at any time, there’s a good chance you’re going to die. As stated a moment ago, there are a zillion ways to die in Hyrule. On top of the environment killing you, or the wildlife, the enemies are especially brutal. Particularly once you get beyond the initial area. Even when you think you’ve got one of the villains on their last leg, they’ll one shot you, and it’s a Game Over. Bosses in the game are also hidden. You never know when you’ll stumble onto one, and when you do you’ll panic. The thing is, the sense of wonder, and discovery balances out the trepidation, and frustration really well. It isn’t hard “Just to be hard”. It’s to more or less affirm that in Hyrule, much like life, you have to get out there, and take chances. You have to go fight zombies at night. You have to risk falling to your death to get that treasure. You have to sneak up on that wild horse, and make him your pet. That’s right, this game also has mounts. You’ll want to use them to get you across long distances. Sure, you can fast travel between shrines, but that doesn’t always get you headed in the right direction. You can also fight while on horseback, which is yet another really cool feature. There are stables where you can keep your horses, and there are shops where you can get new clothes, weapons, food items, and other stuff too. All of this in addition to the campaign’s many missions. It all culminates to make one of the best single-player experiences in a long time. It also supports any Zelda themed Amiibo toys you may have. The Breath Of The Wild figures, aren’t the only ones. If you’ve got the Super Smash Bros. themed Zelda characters those work too. The in-game content varies, some of them clothing items, but most of them random loot drops. Visually, the game is pretty stunning. I own the Wii U version, though I’ve seen the Switch version first hand. They’re largely similar, so whatever Nintendo machine you decide to buy the game for, it isn’t too different. That being said, I have noticed the Wii U version has lower texture quality (Think a PC game’s *medium* setting as opposed to *high*). But the physics of the wind blowing grass in the fields, or the little touches like insects flying off of flowers, or tiny birds fluttering about, are all here. Unfortunately the one major issue affecting the game is performance drop off. It isn’t uncommon for open world games to have performance issues, as they’re some of the more demanding games for video cards, and chipsets to render. In the case of Zelda, some of the drops are really rough in some areas. The initial area seems to be the worst since it is so densely populated with objects, and NPCs. Factor in the special effects, and the frame rate begins to take a big hit. Now the good thing is, these still aren’t bad enough to make things unplayable. It’s still responsive enough to do what you need to do. But it will be noticeable, both from a visual standpoint, as well as feeling. Movement becomes sluggish, and frame drops will sometimes make it look choppy. The other saving grace is these usually only last a few seconds, and in the scope of the game world, they’re pretty small areas. Still, for some players it is going to be really annoying. The other issue is that at least on the Wii U, you’ll see a significant amount of pop in a few areas, as it looks like the draw distance was adjusted to increase performance. It’s a pretty minor nitpick in the grand scheme of things. Still, seeing wild sheep randomly appearing as your parachute passes over a farm, or seeing details of rocks load in when you get closer to a mountain, are noticeable things. Nothing that ruins the enjoyment, but it is a technical issue that open world games often have, and Zelda is no exception. Be that as it may, the game still looks beautiful, taking the pseudo cel shaded look of Skyward Sword, and merging it with some of the realistic look found in Twilight Princess. The result is pretty great, giving a nice mesh of fantasy, and realism. It can be very vibrant, rich, and colorful when it needs to be. It can also be very grim, frightening, and full on terrifying when it needs to be. This gives an already great game, an amazing sense of atmosphere. The dynamic soundtrack does this as well. In many ways it reminded me of playing one of the Metroid Prime games. A song that fits any situation. When things are bleak, the music reflects that. When things are hopeful it reflects that too. Even when things are calm, it manages to come off with something light, and nurturing. Unless you start thinking things are too quiet. In which case the game probably thinks that too, so the soundtrack begins to change. I could probably fit another 8,000 or so words into this review talking about the excellent weather effects, how you’ll freeze to death in the snow without the right clothes. Or how great the animations are for any situation. Or the effective use of day, and night cycles. Or the neat little effects like fire burning grass when you swing a lit torch at a bad guy in the fields. Or about how you need to solve the shrine dungeons to get enough McGuffins to go to another place to extend your life meter (Okay, another spoiler there.). I could talk about the importance of towers, and constant saving (Again, you will be screaming “NOOOOOOOOOO!! !” a lot.). But I don’t want to give everything away, nor do I want to prattle on too long. The point is, that yes, The Legend Of Zelda: Breath Of The Wild is worth getting, even if you’re not a rabid Zelda fan. The technical hitches keep me from calling it sheer perfection. But if you haven’t owned a Nintendo console since the Gamecube, it makes for a very strong launch title for the Switch. Likewise, if you own Nintendo’s current system, and want to wait until there are more games for the Switch before buying one, this is a terrific sendoff for the Wii U. It’s a huge game with hundreds of hours of content. Not busy work. Not banal tasks. Real stuff. Plus, by the time you do see everything the digital expansion pack they’re working on will be out, which could possibly make a great game even better. Early adopters get some in-game cosmetics, but I recommend waiting, until it arrives. There’s already a ton to do in the initial game. The Legend Of Zelda: Breath Of The Wild is excellent, and an early contender for many GOTY lists. Whether you experience it in the flashy new sports coupe or the old jalopy you’re going to be going on one hell of a ride. I’ve still got a long way to go journeying through it. But at 40 hours in, I think it’s safe to say this is one ride worth taking. Every so often a game tries to wear multiple hats at once. In a giant stack. Trying to merge many different genres together. Sometimes this works very well. Sometimes it doesn’t. Or sometimes it works, but not as well as you might like it to. PROS: Engaging, deep game play. Challenge. Humor. CONS: clichéd storyline. Poor explanations of inputs, and rules to the player. STAR TREK: There are a lot of parallels to the franchise here. Fans may want to jump in. Interstellaria has a lot of genre elements in it. Point & Click adventuring. Strategy gaming. Space simulation. It takes all of these elements, and attempts to make a really delicious video game stew with them. At face value, it comes off as a rousing success. In practice, it’s a bit of a mixed bag. Interstellaria starts with a short series of cinema screens that move the basic plot around. It’s years after a world war, corporations have taken over, and mankind heads to the stars. Where the threat of interplanetary war looms. You start out as a randomized character, in a building. Your roommate kicks you out of your apartment, and you have to go looking for a job. the hunt takes you to a job on a freighter, where your space adventures begin. 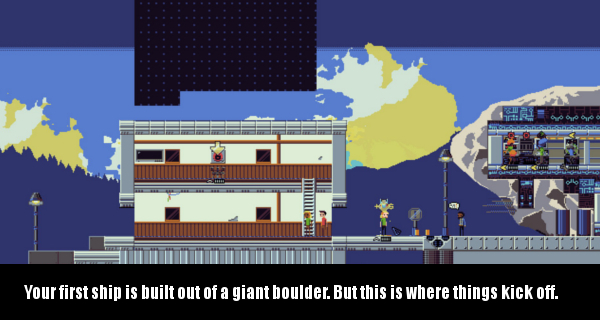 From here the game takes on elements from very early home computer space sims, and bits of FTL’s ship building. The ships allow you to place weapons, sleep chambers, warp core engines, tactical computers, and navigational computers around them. You can assign a role to each member of your crew. Captain, Engineer, you name it. You can also rename any of your playable characters. You can give them friends’ or relatives’ names. You can stick with the zany names the game generates. It’s entirely up to you. The game has a lot of things to keep an eye on. You have to make sure you have enough crew members for each important role. Someone to pilot the ship. Someone for weapons. Someone for engineering. Think of this as an unofficial Star Trek game, and you’ll start to see the potential. 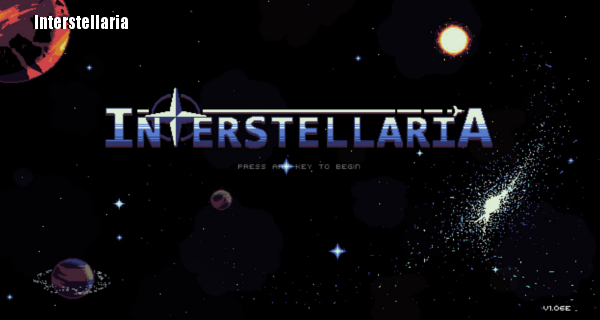 Like the show, Interstellaria has you exploring the cosmos looking for new worlds to explore. When you discover a world upon landing (or crashing) on it, you can move your characters about searching for resources to bring with you. You can meet new characters, recruit them, and build your crew. The game will have you spending hours doing this. Discovering planets, life, and giving you a lot to do. You’ll also have a number of encounters in space. 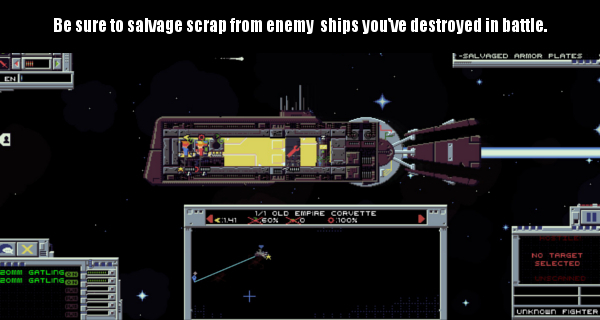 Sometimes a hostile race will come along to destroy your ship. Other times you can hail them, and attempt diplomacy. 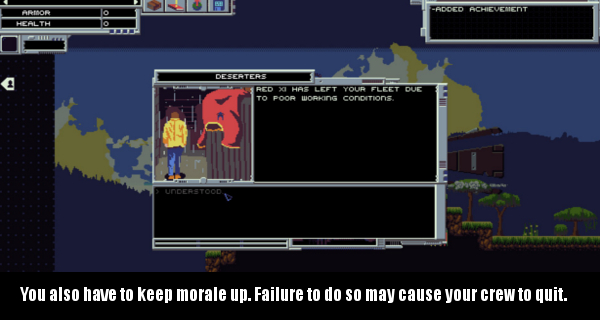 The game has a lot of amusing dialogue trees during these moments as they lampoon a number of its sci-fi influences. Throughout the game you can also find items to enhance the statistics of your crew members. Some may give them faster speed, but cost more food consumption. Or let them stay awake much longer at the cost of another stat. The ships you command work very much the same way, and you’ll spend a lot of the game micromanaging the status of your engines, weaponry, and navigational computers. During space combat you’ll also pull up an overhead combat screen where you’ll move your cursor around attacking enemy ships, as well as moving your own ship. This is where some of the game’s flaws start to crop up though. The game has a way of overwhelming you with the amount of things you need to pay attention to, and not directing you on how. Or more accurately not directing you on how with proficiency. There are text boxes that will pop up telling you to turn on weapons before you try to shoot them. There are text boxes telling you to move a guy to navigation. But it isn’t obvious just on how to do that. Especially when you start playing it for the first time. Even if you’ve played a handful of times it isn’t always obvious. This becomes less of a problem if you get invested in the game. But for a lot of people, that means a lot of game time spent on training yourself to go through some seemingly archaic interfaces, and menus. Which isn’t fun to do. So it has the problem of hooking people from the outset. The game also has a number of small bugs. Giving items to certain characters can crash the game. For instance giving a robot character an item that uses food points, causes the robot to get hungry. Since the robot cannot eat, the game confuses itself, and crashes. On the surface, someone may say, “Oh it requires food. Robots don’t eat food. I can’t use this.” In practice you’ll have players who like to experiment, or players who don’t pay attention, and inadvertently discover these glitches. No game is bug free, and these bugs don’t completely ruin the game. But some of them will make you groan if you find one after sinking a lot of time into the game. So do save often. 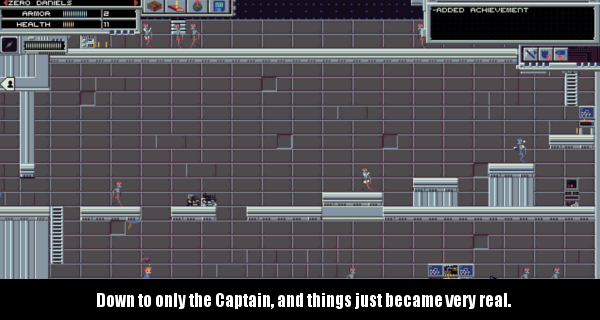 The game doesn’t have quite the level of randomness of space roguelikes such as FTL. The map is the same, the instances are in much the same order. But the battles are randomized. The drawback is once you’ve discovered all of the planets you’ve seen most of the exploration portion of the game. But you might keep coming back for the battles, and ship building. But even with that being the case, many of the old space sims it pays homage to worked the same way. If you’re looking for a campaign you can take at your own pace this will still appeal to you. If you’re going more for a randomized builder it still might, though not quite as much. In spite of its shortcomings I still recommend checking the game out. Especially for Star Trek fans looking for something that captures the spirit of the shows. It manages to be fun, if sometimes frustrating when learning what you’re supposed to do. But once you get past the learning curve it can be a blast. You can also be forced to start over too through your own ineptitude. So it isn’t a foolproof run once you have a handle on the star map chart. Your entire crew can die in a battle leaving you with no other option. It’s a challenging game. It’s worth playing. It just has some issues that keep it from reaching top warp speed. 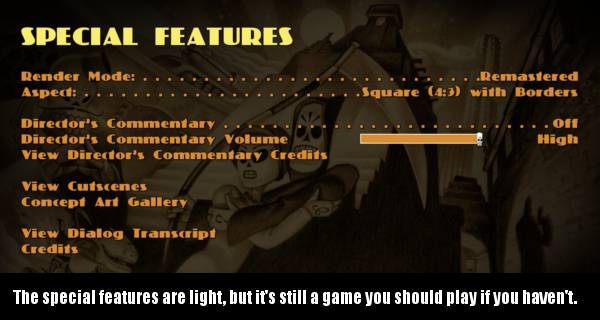 I’ve said it before about other games, but it seems almost pointless to review Grim Fandango Remastered. It’s a good game. It’s a wonderful game. You’ve probably heard every big name from Jeff Green (of Computer Gaming World fame) to PushingUpRoses (of YouTube fame) sing its praises many, many times since it came out way back in 1998. So why bring it up again? Well, the recent re-release has had some time to simmer, and this might shock you. A lot of folks didn’t play it back in the day. Plus there are a lot of folks who weren’t around back in the day, and five of you may have somehow missed all of those other reviews, articles, and episodes. PROS: The Lucas Arts classic adventure game in High Definition! CONS: Not much replay value. Light on extras. LAST OF THE GIANTS: Despite the critical acclaim, the original game didn’t sell as well as Lucas Arts needed it to. Before delving into the game itself again, I’m briefly going to go over the extras. 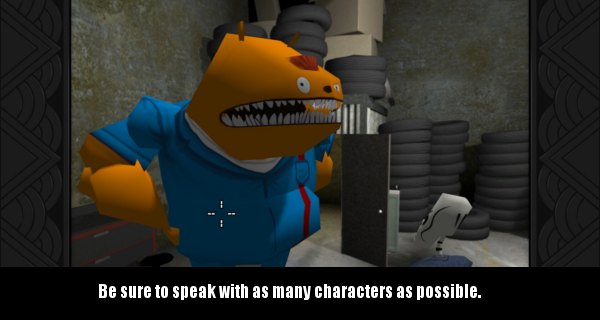 To be honest, Grim Fandango Remastered does not offer a lot in the way of extras, and bonus content. It doesn’t even offer much in the sense of settings in the PC version. You get a handful of sliders, and aspect ratio options. That is all. While this is a re-release of a fairly old game, this is pretty threadbare. The game was originally on PC, and while this re-release was shooting for the PS4 audience, the PC should have added some drop menus at the very least. Thankfully, one really helpful inclusion is the added mouse controls. Originally the game used a setup similar to Resident Evil’s tank controls. Those are still present in this version, but the mouse controls are much nicer. The game ends up feeling much more like the point, and click games that inspired it as a result. They’re not perfect, as sometimes you’ll want to go in one direction, and the game will think you indicated something else. It can be annoying, but it is a lot better than trying to navigate the game with tank controls. If you’re insistent on using the tank controls, they’ll take you right back to the days of Resident Evil 2. They work exactly as you would expect. You use the arrow keys to move, and a handful of other keys to perform functions.The problem with them is that going back to that scheme can feel very clunky. Particularly when trying to navigate around some of the objects. Even if it does give you the convenience of using a game pad or a keyboard. Still, if you prefer them for whatever reason, you’ll be happy they’ve been left intact. Moving the mouse about the screen will pull up various icons when you discover an interactive object. One of them will have a description recited to you, another will be a command to take the item, while others will use an item. When moving your character with the mouse, you’ll just click wherever you wish him to go, and he will begin the long walk. Double clicking the mouse will cause him to run. Something handy to know when you want to get somewhere right away. This version also has much sharper graphics, and textures, which is great because you can see certain interactive items much easier. It also makes reading crucial text easier as the crisp resolutions are easier to see. 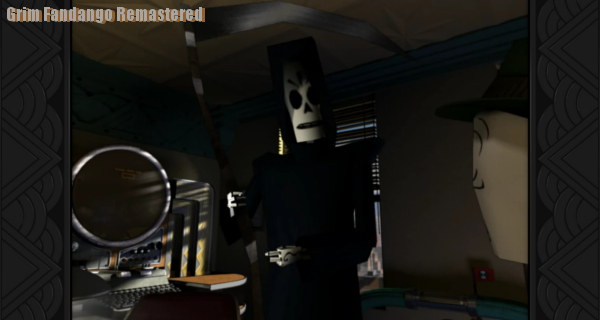 Grim Fandango tells the story of Manny Calavera (played by Tony Plana) who works in a travel agency in the afterlife. As a Grim Reaper, he has to get souls from the land of the dead to the ninth underworld. Clients who lived with enough virtue have more clout in the world, while those who lived pretty dastardly ones have very little. The worst of which are seen to have to make the journey on foot. Of course, Manny also has to deal with his overbearing boss who demands he turn high margins off of clients that are essentially loss leaders. Things get exciting, and terrifying when he manages to snag a higher ended client away from a coworker though, and that is when the game goes into high gear. The story has a number of twists, turns, involving mystery, and betrayal along the way. I won’t go into it here in case you’re one of the many who missed it in 1998. But there are tons of places online that go deep into the storyline if you want to see spoilers. Being an adventure game, I would advise against that, as the story is pretty much the point of playing the game. 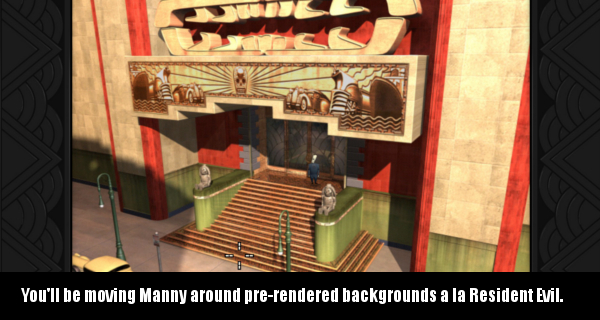 Grim Fandango has a lot of great things going for it. It has hours of superbly voice acted audio to go along with dialogue trees. It has many well designed puzzles in it, many of which you’ll solve by accident. The game implores you to explore each area, at your leisure. Taking your time, checking out every nook, and cranny of every area. The game’s areas are laid out very similarly to Capcom’s Resident Evil. Each room is a huge pre rendered background, and you explore these rooms for items, puzzles or other characters to interact with. Sometimes the story will lead you to back track to somewhere earlier for something you may have missed. But it never feels tedious, or boring thanks to the addictive atmosphere. The game has a four act structure that you’ll eventually play through. The game is almost impossible to lose. So those worried about high difficulty need not worry. 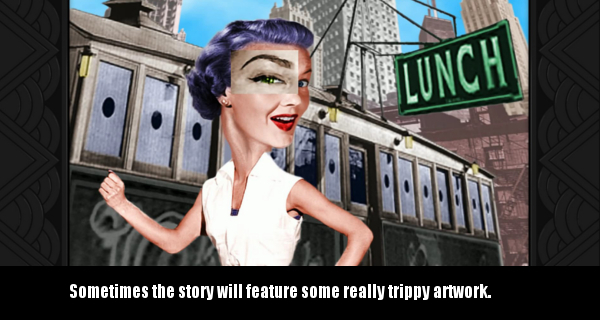 Adventure games of this ilk, are, and always have been about the narrative, the characters, and the world presented. The best of them will keep you invested with all of these elements. 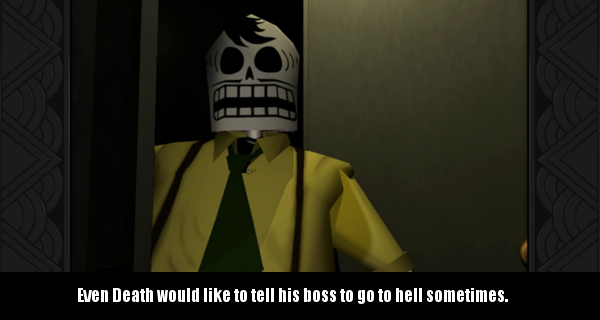 That’s why Grim Fandango is considered one of the best. There are excellent performances from Tony Plata, Maria Canals, Jim Ward, Alan Blumenfeld among others, as well as a lot of creativity. The game blends a lot of Aztec folklore, with film noir to create not only a really fun story, but a really great aesthetic too. The game’s visuals are heavily inspired by the Mexican Day of the Dead imagery, but has its own unique spin. Combine this with hints of Humphrey Bogart movies, and you have a winner. If you already own an original copy of Grim Fandango, there are a few positive reasons to pick up this remaster. First, (assuming you’re getting the PC version) you’ll be able to run it on a modern system natively. You won’t have to fiddle with DosBox emulation. Second, the improved graphics, and controls are a Godsend, that make an already great adventure game even better. The extras again, may not really do it for you, and again the lack of graphics, and performance options are a little bit disappointing. Nevertheless, with all of the improvements, and even some overhauls (some of the content was actually redone as it couldn’t be re-acquired, or imported properly.) it is still a title worth considering buying again. Especially if you are a big fan of Tim Schafer’s other major work. For those who have never played this game previously, you pretty much need to experience it. Whether you buy the PC or PS4 version is immaterial. This game is almost essential due to the historical relevance, and its well deserved reputation in the realm of point & click, and adventure games. One might ask “Why bother reviewing Super Mario 3D World?” Everyone in the gaming press pretty much loved it upon its release. It’s one of the best games on the Wii U, and one of the bright spots in an otherwise dreary time for the console. On the other hand, there are a lot of people who haven’t played it, and perhaps I can add something new to the discussion despite being late to the party on this one. What you’ll love: The new power ups. The 4 player mode. MiiVerse stamp collecting. What you’ll hate: Probably nothing. Though you might have wanted more sandbox levels. Get on the floor: Bowser is apparently way into Disco. Super Mario 3D World is easy to write off as the big brother of Super Mario 3D Land on the 3DS. Many did just that to New Super Mario Bros. Wii, as well as New Super Mario Bros. Wii U when those games came out. Despite the fact that they were both, and are very good games in the long line of Super Mario Bros. games. But to paint SM3DW with that same brush would actually be pretty far off of the mark. Super Mario 3D World is actually more of a send up of every kind of Mario platformer rather than a strict 2.5D or 3D sandbox game. There are moments where you will have a sandbox or side scrolling experience. But most of the game’s levels are structured somewhere between the A to B design of Super Mario Galaxy, and the exploratory design of Super Mario 64. The game seems to cast the widest net this way, hoping to get not only long time fans of Mario, but lapsed fans, and new players as well. All of the levels are fun, and in many cases addictive. As in every game since the Nintendo 64 era there are stars to collect in every stage. Every stage has a certain number of stars that need to be found in order to be able to play it, and most stages have three stars hidden within them. Some of which are a huge challenge to find, as they are well hidden. You’ll also need to use the gamepad’s touchscreen in a few levels, using it to open doors, pull out platforms, and more. But you will replay that level. As well as all of the other ones. Because you will become a star fiend trying to get through to the end. Furthering the need to find secrets are the MiiVerse stamps in almost every level. These stamps don’t do much for you in terms of winning the game. However during your time with the game you can connect with other players for strategies, asking where a secret item is, or even just venting about your 43rd loss on Grumblump Inferno. When you do, you can use the stamps to illustrate your message to the other players. Also coming over from MiiVerse is Ghost Data. This feature shows Mii’s from other Wii U’s during your time in a stage, playing that stage, as you are playing (Say that five times fast!). This sometimes shows you how to find a star, or secret area because you can see what other players were doing when they played the stage you are currently in. The downside is sometimes on a difficult section you may find yourself paying more attention to the Mii than the stage hazards costing you precious lives. Stages are laid out in worlds. Much like Super Mario Bros. 3, Super Mario World, and the New Super Mario Bros. series there is a map screen you can explore. When you’ve gotten enough stars you can enter stages. At the end of every world is a castle stage with a boss. Defeat the boss, and you get to go to the next world. Rinse. Repeat. There are not only your standard stages in the worlds, but also Mystery House stages. These stages can give you anywhere from five to ten stars, and put you in a timed gauntlet of puzzles on par with those found in Valve’s Portal. There are also Captain Toad levels where you have to traverse a fully 3D stage without the ability to jump while figuring out how to get the stars within it. Usually these have at least five stars to collect. If all of that wasn’t enough, elements from previous map screens return. Super Mario Bros. 3 had Toad houses, where Toad would give you free power ups. They’re back. Super Mario Bros. 2 had a slot machine for 1-Ups at the end of every level. They appear on the map screen here. SMB3’s encounter spots are here too. So you may have to tangle with 3 Hammer Bros. one world, or Charging Chucks on another. New to the map screen are Sprixie houses, where a Sprixie will give you a free stamp. Most of your favorite power ups from Super Mario Bros 3 return. Of course you’ll see the iconic Mushrooms, and Fire Flowers. But you’ll see The Tanooki Suit, Hammer Suit, Kurbio’s Shoe ( as a skate mind you but it’s here). The new attraction of course is the Cat Suit. This suit allows Mario, and the others to climb walls for secrets, break certain obstacles, and leap great distances with a pounce. There are also cherries. These clone your character allowing you to solve certain puzzles. You’ll also see a lot of glass pipes holding items, stars, and even enemies. These not only give you the ability to go further in a level, or lead you to secret areas, but some act as well crafted puzzle sequences. You’ll also notice I said “Mario, and the others” in the previous paragraph. That is because the game also brings back Super Mario Bros. 2’s biggest feature: Pick the right character for the level. Each character can, of course complete any level in the game. However, some levels will be easier with certain characters. Almost every level has an item only one of the four characters can get without using an item. Some go as far as putting a switch in with the character’s face on it. Essentially letting you know you HAVE to use that character to see what that switch will do. This also leads into the multiplayer co-op feature. Super Mario 3D World can be played with four players for couch co-op. While it’s unfortunate there is no online co-op, the feature does lend itself well to party gaming. It has a very nice balance in terms of the risk of lone wolfing levels, or trying to really work as a team to get the job done. Each of you will get a different character: Mario, Luigi, Toad, or Princess Peach (Toadstool if you’re an old-timer like myself). Mario performs as you’d expect. Luigi tends to skid farther so he feels slippery at times. But he jumps significantly higher than the rest of the characters. Toad tends to run the fastest, but doesn’t jump very high at all. Peach can float for a short time, making her a nice option on stages with a lot of pits. You can also play as Rosalina, (The mysterious character from Super Mario Galaxy, and it’s sequel) by getting enough stars to unlock a stage in a secret world. If you, or one of your partners find yourselves too agitated by a certain part of a stage there are also the golden Assist Blocks. These allow players to essentially coast through, flying over the entire level. Beware though, if you use this feature even one time, it forever taints your save file with the inability to have glittering stars as reminder that you used it. If by the end of the game you have enough stars you can open up secret worlds. Of course there is Star World, but there are even more beyond that. If nothing else this game gives you more content than a lot of other games do for your $60. Visually, the game is very impressive too. Nintendo’s artists always do an amazing job with character models, textures, and art in general but this game is gorgeous. It may not be to the level of a bleeding edge PC game. But even those obsessed with photorealistic graphics will admit that it still does look really good. It’s bright, it’s colorful, it’s a lot of fun to look at. It’s even fun to listen to. Of course Charles Martinet is back, and great as always. But musically this game is also a joy. Every song accents what is happening on the screen near perfectly. While the story in the game is your typical Mario fare, the music still goes a long way to making you care about what is going on even if it isn’t very deep. One stage features a very catchy New Wave song that plays while parts of the stage appear, and reappear in time with the song. One world map screen has music right out of a Roller Skating Disco movie. Other stages have grand orchestral themes. Other spots feature some Jazz. All of it going a long way to help tell a tale about the four main Mario characters stopping Bowser from keeping fairies called Sprixies captive in jars. Why does he want them held captive in jars? Because he wants to use their power to take over the world. Again. For what has to be at least the thirteenth time. It all comes together in a really great package that like all of the Mario games before it is indeed a must buy for any Wii U owner. It’s one of the most fun games to come out near the end of last year, and if you missed it, pick it up while you still can. Even if you don’t typically play platformers it’s a fun ride worth taking.